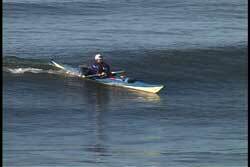 If the waves are not too big, I like taking a quick ride and then use the whitewater of the broken wave to side surf me to shore. 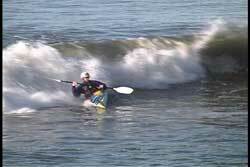 I call this the lazy paddlers surf landing, because you really don't need energy to land. You do need to know how to ride a wave and more importantly how to side surf. 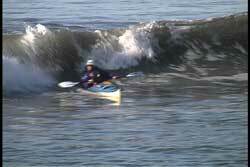 See USK article, "Side Surfing Control". 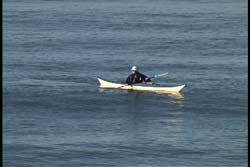 If you turn your kayak too soon, you run the risk of having the wave go underneath your boat, because you are slowing down with respect to the forward movement of the wave. 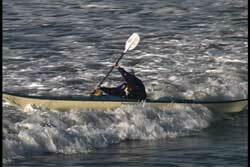 You also run the risk of turning back up over the lip of the wave if you turn too much or too soon. 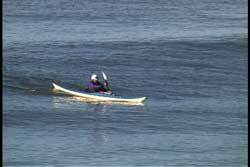 That is OK if you want to ride and get off in order to go back out to catch another wave. 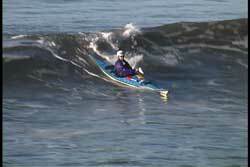 See USK article, "Surf A Wave And Get Off." 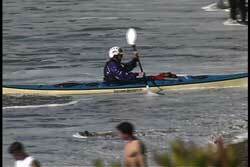 You can see his kayak gets turned by the whitewater. 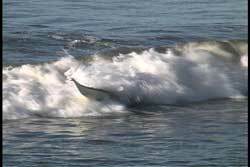 Even though Rod is completely submerged under that froth, he is edging toward the wave and doing a high brace with his elbows pointing down to protect his shoulder. See USK article, "Shoulder Safety". For me this is the fun part of going toward shore. I get a chance to hang out and watch the scenery while the wave does the work. I also like to practice my forward and reverse supportive sweep strokes , which allows me to move forward or backwards while side surfing. 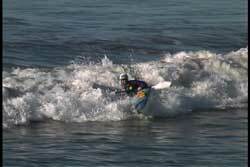 See USK article, "Side Surfing Control." 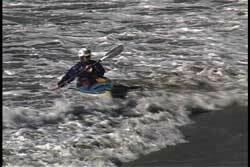 Pictures seen above were taken from the USK Video "ABC'S of the Surf Zone" , winner of Years Best Video 2005 from Sea Kayaker Magazine Reader's Poll. Thank you Rod Tucknott for a great ride. Rod Tucknott runs UCSB Adventure Programs and is an ACA Instructor.